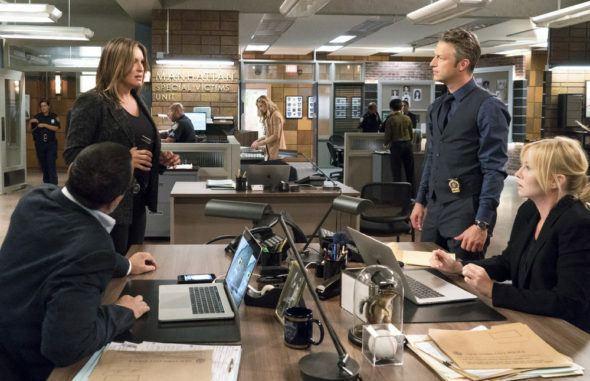 Are Olivia Benson and the Special Victims Unit still at the top of their game during the 20th season of the Law & Order: Special Victims Unit TV show on NBC? As we all know, the Nielsen ratings typically play a big role in determining whether a TV show like Law & Order: SVU is cancelled or renewed for season 21. Unfortunately, most of us do not live in Nielsen households. Because many viewers feel frustrated that their viewing habits and opinions aren’t considered, we’d like to offer you the chance to rate all the season 20 episodes of Law & Order: SVU here. *Status update below. An NBC legal drama, Law & Order: Special Victims Unit stars Mariska Hargitay, Ice-T, Kelli Giddish, Peter Scanavino, and Philip Winchester. The police procedural centers on Lt. Olivia Benson (Hargitay) and her elite squad of New York City Police Department detectives who investigate crimes including sexual assault, child abuse, and domestic violence. What do you think? Which season 20 episodes of the Law & Order: SVU TV series do you rate as wonderful, terrible, or somewhere between? Should NBC cancel or renew Law & Order: SVU for a 21st season? Don’t forget to vote, and share your thoughts, below. *3/29/19 update: NBC has renewed Law & Order: SVU for a historic 21st season. Law & Order: SVU: Cancelled or Renewed for Season 21 on NBC? Law & Order: SVU on NBC: Cancelled or Renewed for Season 20? Law and Order-SVU should be renewed for at least Season 21…I’d say they should consider ending it after Season 25 or more! Mariska Hargitay is amazing as Olivia Benson! Long live SVU!!! Only show I can rewatch over and over and still love it like the first time I watched it. Been watching it since the first episode aired! I just got done re watching from season 1 and think I might start again because I cannot find anything worth watching anymore. I am very picky and cannot wait to watch season 21. I love S.V.U i have seen all season’s. Olivia Benson is an unbeleivable actress. I was sad when Stabler left. I just hope they don’t cancell the show. It has changed alot peoples life’s. I don’t think there has been a show that has. Good to see this show is around. Still great after all these years. What does this have to do with SVU? SVU is such an amazing and unique show that inspires, teaches, and gives hope, and provides awareness to so many people. We need this show! I’ve been watching since the begining and will never stop. Please continue to renew, as this show is a part of so many of our lives!